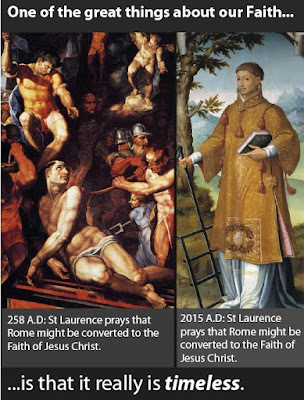 Laurence's witness to Jesus Christ is still relevant, particularly today, because he shows us, like so many martyrs, that there is no 'easy road' to heavenly glory. His witness puts paid to the idea that mortal men are incapable of doing, with God, that which is impossible by nature. The martyrs don't, it seems, suffer from 'Kasperism' however. If Our Lord Jesus Christ is and was pure and chaste, with His help, I can be pure and chaste. If the Lord Jesus loves with a love that is Divine, I can love with a love that is divine. If Our Lord Jesus Christ is and was merciful, with Him, I can be merciful. If the Lord Jesus Christ can face anguish, torture and humiliation and cruelty, I can suffer it too, but more, it is a joy to suffer it, for Him. Faith in Jesus Christ means we can become like Jesus Christ, think like Jesus Christ, live like Jesus Christ, love like Jesus Christ and die, if we are so privileged to be so persecuted, like Jesus Christ. Jesus Christ, because He is Lord, makes all this possible to me and to all who believe in Him. It is only I who can stand in the way. Jesus Christ can enable me, if I beg Him to, to imitate Him and be united to Him in this life and for all eternity because Jesus Christ is Lord. This is what the Catholic Church believes. We are called to become by adoption what Christ is by nature. We have a living relationship with God in His Church. We do not proclaim a dead Faith about a dead God but the the Living One. We are called to be like Jesus Christ, to become adopted sons and daughters of the Father Almighty. Of course, if you don't believe Jesus is truly Lord, the Eternal Word made flesh, none of that is remotely possible, not in a million years. I don't know how long it took St Laurence to die having been placed upon his grill, but he can certainly speak to us today about patience in suffering, holy perseverance, forgiveness of our enemies and the love which conquers all. If One Peter Five's very interesting post on Bishop Athanasius Schneider's latest interview is anything to go by, we are going to need all the holy patience and perseverance, and Laurentian bravery, in this most harrowing and arduous of times, that, by God's grace, we can obtain. St Laurence, pray for us! Pray for the Church of Rome! "Pope" Francis is loosing his catholic reason and spiritual sens, if he ever had such before! This is a sign of his total inability to serve Catholic Church as its head. He suppose to be impeached for this betrayal. This even looks like pure joke from teaching of Jesus Christ. God help his faithful and remove him from this position! He is unable to run your church!!! “Give me an army saying the Rosary and I will conquer the world.” It certainly worked at Lepanto, and probably at Vienna in 1683, and in Poland at the miracle on the Vistula. This article is one of the wisest and best things I have read for a long time. Thank you, and God bless. Every day is the Feast of the Creator.....it's just another trick to earn money,like the Jubilee of false Mercy, el senor bergoglio is not a pope and is not catholic, pantheist, maybe, but, please, we still have a Pope, we don't need a Bishop, neither Rome does. Nice article, Bones, thank you. God bless.